Rinnai RL94eN Natural Gas Tankless Water Heater space-saving, energy-saving and easy to install…. All homes need hot water, especially during the cold winter months. Not only do people need it, but they also want it fast and available 24/7. However, not everyone wants to pay the price for these conveniences. The good thing is that there is always the option to get a tankless water heater. The more popular way of having readily available hot water at home is by having storage water heaters. This works by having a tank or a water storage that keeps hot water. While the hot water is being consumed, the tank is continuously filled with cold water, so hot water will not run out. However, using this kind of water-heating systems involves what is called as “standby heat loss”. Standby heat loss happens when there’s no one using hot water at home, but the heater still runs and tries to keep the water warm. To address this issue, homeowners can opt to use demand water heaters. This kind of heaters only works when a faucet or shower in the house is turned on. According to studies, for a house that needs around 40 gallons of water on a daily basis, a tankless water heater can save the family as much as 30% on energy. This energy efficiency decreases as the need for hot water increases. For a home that uses around 80 gallons, the savings could be as much as 15%. That’s still better than not having any savings at all. 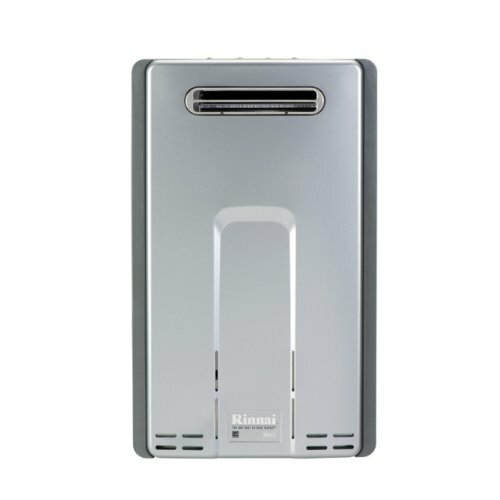 One of the more popular brands of tankless water heater these days is Rinnai. Rinnai Natural Gas Tankless provides a continuous supply of warm water both indoors and outdoors, and could save homes some bucks in energy consumption. The Rinnai RL94eN Natural Gas Tankless Water Heater is one of the most durable water heaters on the market today. The manufacturer even provides 12 years of warranty for each unit, proving that each of these heaters will last for many years. Aside from the durability, this water heater is also energy efficient since it can save up to 80% of energy per household. Each unit comes with a touchpad and a digital display for setting the temperature, which is very useful if the user needs to prepare it for bathing pets or babies. Also, water can be heated up to a maximum of 140 degrees Fahrenheit for residential installations. Likewise, it can provide a steady supply of water, at the same temperature, of up to 9.4 gallons. According to experts, that is enough for five members of the family who are taking a bath all at the same time. This water heater also has a sensor and an indicator when it needs to be back flushed to make sure that it functions efficiently every time. The following are the major advantages of purchasing and installing Rinnai RL94eN Natural Gas Tankless Water Heater in a residential property. This tankless water heater should be easy to set up and install provided that the user has some do-it-yourself or DIY skills. Nevertheless, the buyer can always have Rinnai technicians work on installing and maintaining this heater for their own convenience. This is considered as the primary reason why people are switching from tank water heaters to tankless heaters. For this particular tankless water heater, it can save homes as much as 80% on energy. Unlike heaters that are meant for tanks that generate standby heat loss, this tankless water system only heats based on demand. This is specifically useful for homes that do not have the family around the whole day. That is because it is not working and not wasting energy when there is no one around the house using it. Thus, it is saving the household a lot of energy and money. Some tankless water heaters do not heat correctly or do not get activated when water pressure is low. Rinnai RL94eN Natural Gas Tankless Water Heater still heats the water up even when only one person is using a faucet, for instance. Unlike storage water heaters that almost immediately supplies warm water, tankless water heaters do not warm water that is in the pipe. This means that if the heater is far from the source (e.g. faucet or shower), the water that comes out is initially cold for a while. This can be solved by placing the heater closer to the primary water source or installing several units and placing each close to the water outlets. Just like everything else made for the house, this water heater needs to be maintained. It needs to be back flushed at least every year, depending on how hard the water in the area is. This procedure should be done to make sure that the heater will work efficiently for years to come. Nevertheless, the good thing about Rinnai water heaters is they can tell when they need maintenance because they have an error indicator. Rinnai RL94eN Natural Gas Tankless Water Heater is a great tankless water heater as it is very energy efficient, it is quick to install, and it works properly even if the water pressure is low. However, it needs regular maintenance, and it does not heat water that is left in the pipes. Just like Bosch tankless water heaters, Rinnai RL94eN Natural Gas Tankless Water Heater is worth every penny. It makes users’ lives more convenient because of its digital temperature setting and its error indicator. It also supplies enough warm water for everyone in the house. Both models are energy efficient and will save users money in the long run. The best thing about Rinnai’s, though, is that it works properly for many years with a very good warrantee. Rinnai Natural Gas Tankless is one of the best tankless water heaters on the market today. Why? Because it provides households up to 140 ºF and 9.4 gallons of hot water per continuous use. It looks as elegant and works the same way as other brands of water heaters, but its warranty offer for 12 years closes the deal.